Transnationalism, Education and Empowerment challenges the prevailing notion that transnationalism is concerned fundamentally with the process of enhanced global population movement that has been allied with modern globalisation. Instead, it argues that transnationalism is a state of mind, disassociated from the notion of ‘place,’ that can be observed equally in societies of the past. Drawing on the context of colonial Sri Lanka and the British Empire, the book discusses how education in the British Empire was the means by which some marginalised groups in colonised societies were able to activate their transnational dispositions. Far from being a universal oppressor of colonised people, as argued by postcolonial scholarship, colonial education was capable of creating pathways to life improvement that did not exist before the European colonial period, providing agency to those who did not possess it prior to colonial rule. The book begins by exploring the meaning of transnationalism, arguing that it needs to be redefined to meet the realities of past and current global societies. It then moves on to examine the ways education was used within the period of 18th and 19th century European colonialism, with a particular emphasis on Sri Lanka and other parts of the former British Empire. 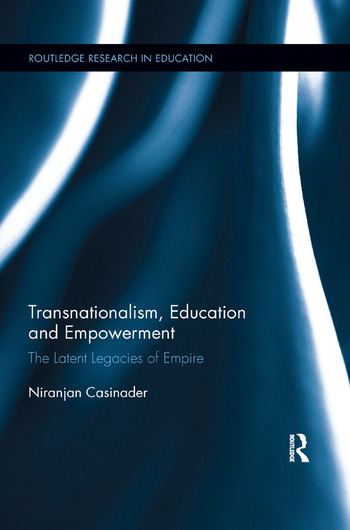 Drawing from examples of his own family’s ancestry, Casinader then discusses how some marginalised groups in parts of the British Empire were able to use education as the key to unlocking their pre-existing transnational dispositions in order to create pathways for more prosperous futures. Rather than being subjugated by colonial education, they harnessed the educational aspects of British colonial education for their own goals. This book is one of the first to contest and critically evaluate the contemporary conceptualisation of transnationalism, particularly in the educational context. It will be of key interest to academics, researchers and postgraduate students in the fields of education, the history of education, imperial and colonial history, cultural studies and geography. Niranjan Casinader is Senior Lecturer in Education (Curriculum and Assessment) in the Faculty of Education at Monash University, Australia. Originally trained as a geographer, he worked as a secondary school educator for many years before moving into academia. His research is focused on three related principal strands: the notion of transnationalism in education, particularly in relation to the impact of culture on curriculum, pedagogy and thinking; the teaching of Geography and other Humanities subjects in schools; and the role of education in British colonial policy and practice, with an especial focus on its relevance to contemporary society.